Gorgeous top quality, baby pink, rough specimen of Kunzite from Afghanistan. Quality specimens of Kunzite are becoming quite hard to find but this is a superb, gemmy piece. This particular crystal has a very 'clean' energy and a beautiful vibrancy. Kunzite is the pink variety of Spodumene (the green and much rarer type is called Hiddenite). The most popular type with healers is the pink (getting its colour from its Lithium rich content) - ranging from a real blue/rose pink through to a beautiful violet pink. It is an extremely peaceful and spiritual stone with a high vibration. Kunzite awakens the heart centre promoting unconditional love. It is an excellent aid for those who find meditation difficult and is a very protective crystal (try placing or holding a piece against your Third Eye). It is said to be able to dispel negativity, and just having it in your auric field is enough to cleanse your aura. 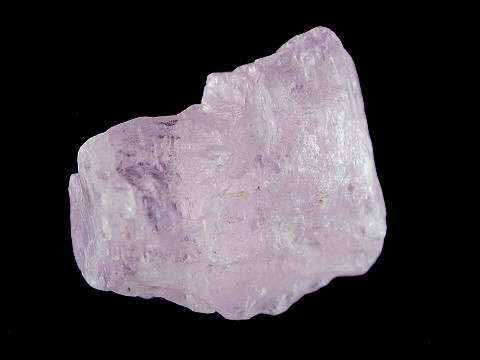 Kunzite is also an emotional cleaner; helping to remove unwanted and unnecessary emotional debris from our mental and emotional bodies. It is also powerful enough to remove emotional clutter which we have brought through with us from previous incarnations. It is an excellent stone to carry or wear if suffering from depression, as its mood-lifting qualities are one of the best in the crystal world. This most beautiful of stones can also be used to help block electromagnetic 'smog' caused by emissions from electrical equipment. Kunzite is excellent for premature babies who are having difficulty adjusting to early life outside of the security of their mummy’s tummy. Best placed under the baby’s mattress, well out of reach, or placed on a table adjacent to the baby’s cot in their auric field. As with all babies and small children, care must be taken with crystals to avoid choking. Never leave a crystal within a baby's reach or leave a young child unattended with a crystal. Some of the best examples of Kunzite come from Madagascar and Afghanistan.